Looking for the fountain of youth is an impossible task so most people resort to surgery and injections to look younger. You look in the mirror and think to yourself “I’m starting to look old for my age. I need to do something stat!”. But what if you’re not into surgery or injecting toxins just to look younger? 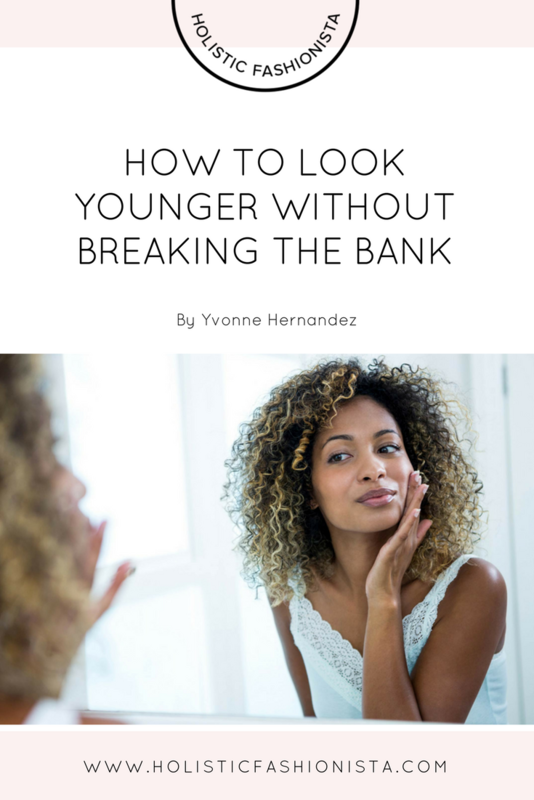 Is there anything that can help you not look older than you are without breaking the bank? 1 - STOP TOUCHING YOUR FACE - Rubbing your eyes tugs on your delicate skin causing eye wrinkles. Also, using your hand to prop your face up at the computer, while scrolling thru your emails or social media, watching TV, or when in deep conversation pushes your skin which will cause wrinkles and saggy skin. Plus, the oils and dirt in your hand will clog pores causing blemishes. Yuck! 2 - SIT UP STRAIGHT - Ok so this might be hard to admit but Mom is right. Slouching causes you to look older. Straighten your back when at the computer, on your phone, watching TV, walking, standing, and even driving. Yes, pretty much always. A fitness expert once told me that the muscles that connect between the chest and shoulder start to shrink if not stretched out by sitting up straight with shoulders back. Think of how much better you look and feel when your shoulders are back! You get that “I can conquer anything” feeling! Girl, you know it's true… so best to sit up straight. 3 - PROTECT YOUR ARMS AND HANDS - Your face now looks tight and firm from using natural remedies but have you forgotten about your arms and your hands? Your face may look 5-10 years younger but your arms and hands now look like 10 years older! Sad, but probably true for most women especially if you wash your hands a lot. I recommend you use sunscreen on your arms and your hands especially when you're driving. Keep a bottle of sunscreen, preferably a non-toxic, zinc oxide based SPF, inside the door compartment so it's within reach. A good sugar scrub (mix 1 Tsp sugar and 1 Tbsp olive oil, scrub and rinse) and using a deep moisturizer with olive oil immediately after a bath or shower or at night will help to rejuvenate your arms and your hands. 4 - AVOID DULL COLORS near your face - Colors like taupe or pale colors next to your face will wash you out. The appearance of dull skin instantly ages you. I encourage you to add color to complement your skin tone and brighten your face. The right colors illuminate your face, bring life to your appearance which in turn gives you that extra confidence when you look in the mirror. I encourage you to play with colors next to your face. Take some selfies to see what colors look the best to give you life. 5 - STOP SQUINTING, FROWNING AND USING EXTRA FACIAL EXPRESSIONS - Every time you squint your eyes you encourage those pesky crows feet and “eleven” to show up and dig into your beautiful face. Girl never forget your shades or reading glasses! Every time you frown and get grumpy you force extra wrinkles to creep in on your forehead. Go meditate! Also smoking (quit if you do) and using a straw force extra wrinkles around your lips! A funny thing that I do is raising my right eyebrow a lot and I’ve noticed how lines keep trying to creep in on the right side of my forehead, rather than my left! #thestruggleisreal LOL! These are just a few of my secrets to keeping my youthful looks at 40+. Quick reminder: Your body is your temple so take care of it. You are worthy and deserving of doing something for yourself every single day! May these tips bring you that extra skip in your step, better selfies, better lives and a beautiful day full of fierce confidence! Girl! You Got This!